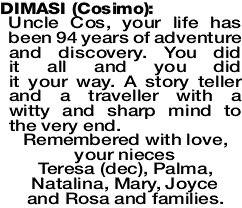 Uncle Cos, your life has been 94 years of adventure and discovery. You did it all and you did it your way. A story teller and a traveller with a witty and sharp mind to the very end. your nieces Teresa (dec), Palma, Natalina, Mary, Joyce and Rosa and families.